Trends in SSD pricing and laptop sales could kill the mobile hard drive in three years. But don't write off traditional drives entirely just yet. If current pricing trends continue, the conventional notebook hard drive could die by 2018, replaced with fast, slim, and increasingly cheaper SSDs. SSDs can generally transfer data faster and with less latency than hard drives, running silently and consuming less power. But they’ve traditionally been priced several orders of magnitude higher than a hard drive of the same capacity, limiting their use to higher-end PCs. Quietly, however, that’s changing. The flash vendors designing the chips used within SSDs have aggressively introduced technology that continues to lower their cost. Meanwhile, hard drive vendors have spent the last 60 years whittling dollar after dollar from the cost of a hard drive, but face slowing price declines that should allow SSDs to catch up. We’ve long said that an SSD is the best upgrade you can buy for your PC. Right now, SSDs aren’t anywhere close to the same price as a hard drive: On a dollars-per-gigabyte basis, SSDs are six times the price of a comparable hard drive, according to Taiwan’s TrendForce. 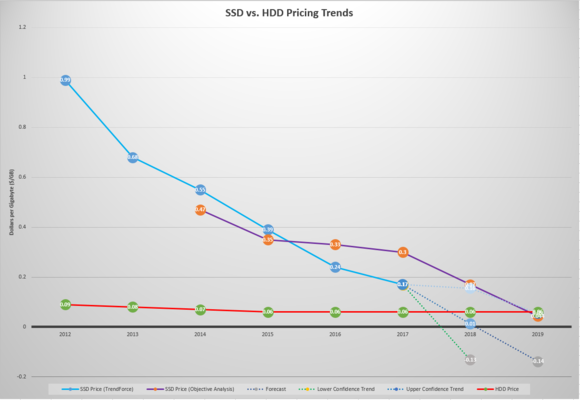 Over time, however, the firm’s data predicts that SSD prices will plunge precipitously, putting SSD pricing on a level with hard drives—whose pricing has remained essentially unchanged. At that point, SSD’s other advantages should give it the edge. Extrapolating the current price trend puts the crossing point at 6 cents per gigabyte. Variances in the forecast model could put that as early as mid-2017, or as late as early 2019. Two different estimates of SSD pricing, mapped against relatively static pricing for hard drives. The rapid price declines have their roots in both technical as well as business causes. Vendors designing flash memory, the building blocks of SSDs, have been busy developing denser multi-layer cell (MLC) flash. Intel and Micron also hope to increase that density further via 3D NAND flash, which promises yield capacities of 10TB inside a 2.5-inch form factor. Competition also plays a role. With really only Western Digital and Seagate competing in the hard drive market, price competition isn’t necessarily as cutthroat as in flash. DRAMeXchange said (as reported by Computerworld) Samsung, Toshiba, SK Hynix, Intel and Micron will maintain their aggressive pricing strategy into the first half of 2016, . The lowered SSD prices should produce a cascade effect, not only spurring SSD adoption but also influencing the design of PCs. Data originally compiled by Computerworld from TrendForce shows that SSDs were used in 21 percent of all notebooks worldwide in 2014. The firm’s forecast calls for that number to rise to 42 percent in 2017. Hard drives, meanwhile, are expected to fall from 79 percent penetration in notebooks during 2014 to 59 percent in 2017. In September, Gartner reported that 277 million “traditional” desktops and notebooks (typically using hard drives) were sold in 2014, compared to 263 million ultramobile (clamshell notebooks and tablets) devices, which use SSDs. By 2017, the firm says, that ratio will have flipped: 296 million ultramobile devices compared to 226 million traditional devices. That, in turn, should influence the design of computers themselves. Apple was one of the first manufacturers to throw its weight behind SSDs with its redesigned 2010 13.3-inch MacBook Air. Since then, similar Windows-based ultrabooks have become more common. IDC also said this week that it expects shipments of 2-in-1 PCs, which dock SSD-powered tablets inside keyboards, to increase 75 percent next year. If SSDs do become prevalent in the notebook market, expect a growing number of thinner, lighter PCs. Desktop users have an entirely different set of requirements. Analysts say that some users will indeed adopt SSDs as boot drives or as devices to quickly launch a few key apps. But consumers will still buy traditional hard drives, especially to store and edit digital video and games. External hard drives connected by high-speed USB 3.0 or USB-C cables will also remain as excellent backups for SSD-powered systems. At some point, it’s possible that mainstream desktops will include a single SSD drive and use external drives or the cloud for backup, but it’s less certain than for the notebook PC. “You can’t store everything on your [desktop] PC inside flash; it’s simply too expensive,” storage analyst Tom Coughlin of Coughlin Associates said. Traditional hard drives aren’t expected to vanish from desktops anytime soon. What the pricing argument also assumes is that consumers will instinctively recognize the advantages of an SSD, and gravitate toward notebooks that include them. Jim Handy of Objective Analysis thinks that won’t always be necessarily true. “I’m thinking of doctors, lawyers, schoolteachers, and firefighters,” he said, who buy on considerations like price, the processor speed, and the amount of storage—not the storage technology. Offer a laptop with a 1TB hard drive for the same price as one with a 256GB SSD, and the average consumer will likely gravitate to the larger drive, Handy said. 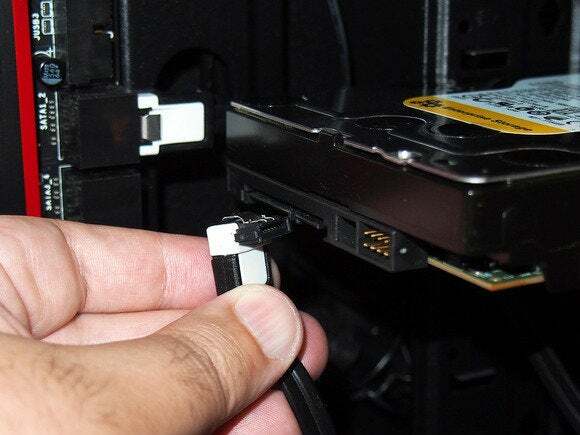 “These people are not even aware of the differences between a hard drive and an SSD,” he said. For now, hard drive makers adhere to the “give ‘em more” argument: For about $100, you can currently buy a 3TB internal hard drive, far more than the 300GB worth of SSD storage $100 currently buys. Technologies like HAMR optically-assisted hard drive technology could ship in volume next year, pushing hard drive capacities to 30TB and disrupting the price-per-gigabyte of hard drives yet again. But traditional hard drive vendors have also seen the writing on the wall: Seagate bought Samsung’s SSD business for $1.4 billion in 2011, and Western Digital has bought SSD makers STEC and Virident. Extrapolating forecasts is always risky, and the data compiled by TrendForce and Objective Analysis differs somewhat. But the downward trend is clear: Unless the hard drive industry can cut its manufacturing costs, it appears that eventually SSDs will become more cost-effective than traditional hard drives in the notebook space. At that point, then, we should expect those hard drives to disappear. There will be exceptions, of course. It’s not hard to believe that gaming notebooks will offer roomy hard drives as an option. 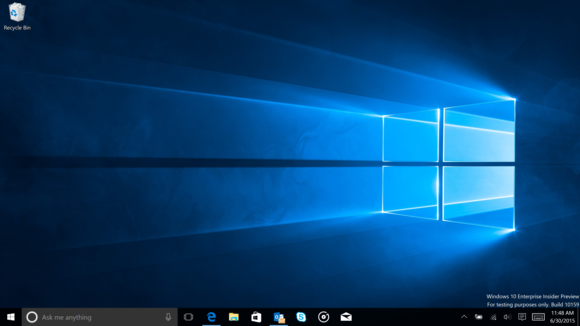 Some movie services, such as Microsoft, allow you to download the film to your notebook’s hard drive, and business travelers might cache a bunch of movies for a transoceanic flight. Still, these will probably prove to be the exception, rather than the rule. An SSD is the fastest way to get from a blank screen to here. Why wait for a hard drive to load? For those of you who have used a laptop equipped with a hard drive, however—well, you already know how awesome SSDs are. Rebooting a PC used to be take enough time to get up and fetch a cup of coffee; today, it’s barely enough time to pull our your phone and check your email. But there’s also the “good-enough” argument. You simply can’t buy a peripheral that can enhance the performance of your laptop’s CPU, or add more memory—so both those components should weigh heavily in your buying decision. But if you want to add additional storage capacity, you have literally hundreds of external options to choose from, SD cards to add, or cloud storage like Microsoft’s OneDrive. You don’t need to buy a laptop with a 4TB hard drive inside, because you can always add that extra storage later. What you’ve got is good enough. But increasing your laptop’s boot speed? Loading a game in a matter of seconds? That kind of convenience comes from only one component: an SSD. And once you’ve experienced it, you don’t want to go back. Lower prices may eventually kill the notebook hard drive in favor of the SSD. And what a great day that will be.